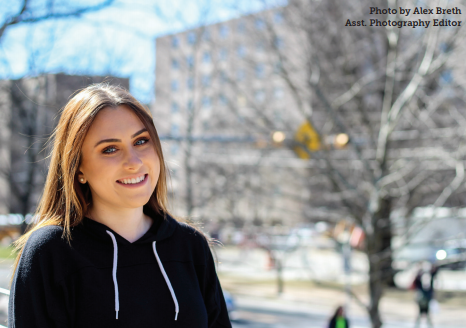 Hannah Cersell is a 19-year-old communication studies major here at West Chester University, although she hasn’t always lived close enough to attend. She moved from London to the United States in August of 2015. “I moved in with my father in Exton and then, one week later, I started college, and that was very scary. I came here because I thought it would be a great experience to go to school in another country. A lot of people can’t say that they’ve studied overseas. At first, I was a bit hesitant about moving here because I used to never really step out of my comfort zone… It’s funny; a lot of people ask me why I came here, and yes, it’s because it’s the closest school to where I live now, but it’s also a really great school. West Chester keeps bringing me new opportunities,” she said. Cersell travels home to London during the summer and Christmas time. However, as of now, her plans post-graduation are unclear. While Cersell may eventually continue on in her travels outside of West Chester and the U.S., it’s clear that her time here has had a significant impact.